Challenge: Promoting an iconic donut shop brand moving into Chicago’s trendy, upscale “Magnificent Mile” retail district. Stan’s Donuts has been serving up freshly made donuts of extraordinary flavors and textures for more than 50 years in the Los Angeles area, and thanks to a partnership with Chicago’s Labriola Baking Company, members of the Chicagoland community have recently begun enjoying the iconic treats, too. 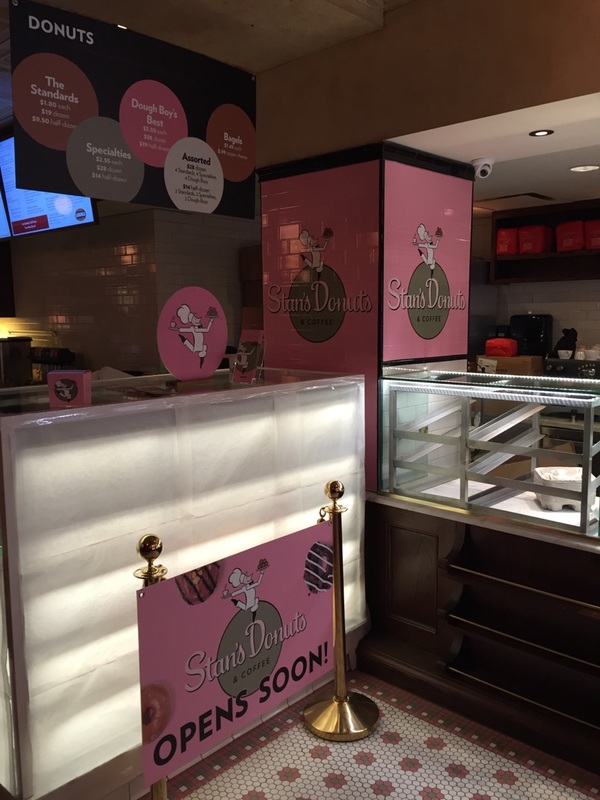 As Rich Labriola, the bakery’s namesake, sought to increase awareness around the opening of a new Stan’s Donuts location in one of his existing cafés on Chicago’s Michigan Avenue, he decided to turn to the pros. Graphic Alliance, a full-service Chicago marketing firm specializing in print and digital media, was tapped to design and deploy engaging graphics inside and outside the bakery, and Graphic Alliance turned where they always do when they want to wow a client: to dependable Mactac graphic products. Graphic Alliance installers set about accomplishing their first goal by using Mactac’s REBEL H product to wrap the 10-foot-tall light poles outside the bakery in bright pink Stan’s Donuts’ branding. “We wanted to create a strong visual impact for anyone walking by, and we knew REBEL H would withstand the elements through harsh Chicago weather,” explained Grossman. Inside the café, Graphic Alliance brought Stan’s Donuts’ branding to life with even more Mactac products. They used StreetRap with a PERMACOLOR® PermaFlex® overlaminate to wrap contoured floor tiles and RoughRAP media with a PERMACOLOR RAYZor™ gloss overlaminate to wrap wall tiles, ultimately creating a wayfinding floor graphic directing customers to the order line, and engaging Stan’s Donuts’ murals on the walls around the service counter. REBEL H product with PERMACOLOR ColorGard™ LUV overlaminate was also used for labeling atop a drink cooler due to its strong performance when backlit. REBEL H is a multi-print media with high initial tack and lasting strength designed for interior and exterior marking such as wall graphics and other signage. Protection from abrasion, moisture and fading from UV light can be achieved when used with PERMACOLOR ColorGard LUV overlaminate. 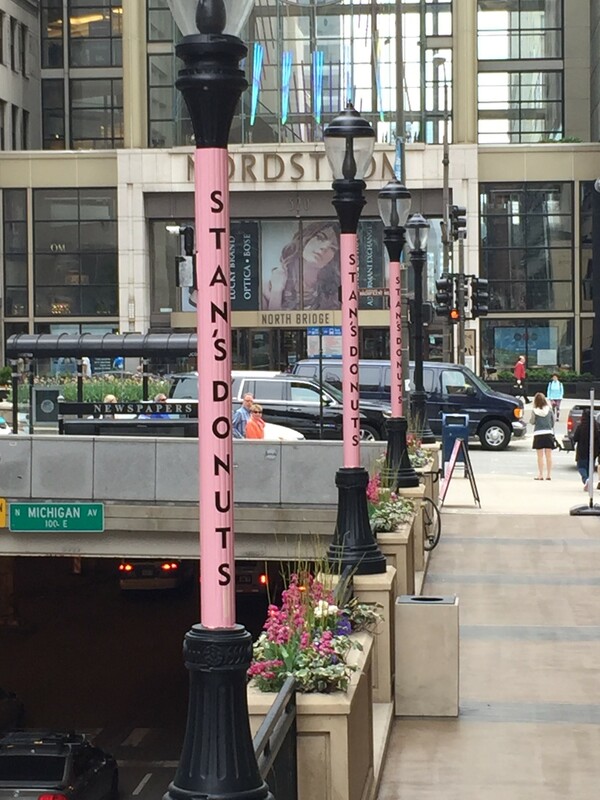 REBEL H was chosen for its quick adhesion and long-lasting performance, allowing wrapped outdoor light poles to resist whatever weather Chicago might experience and to bring Stan’s Donuts’ branding to a consumer-facing drink cooler. StreetRap has an aggressive solvent acrylic adhesive that is ideal for adhesion to unsealed concrete or asphalt surfaces, and to select smooth or slightly rough wall surfaces. Outside glare is eliminated by pairing with PERMACOLOR PermaFlex overlaminate which also adds slip-resistance assurance. StreetRap brought the longevity and strong adhesion performance needed to continue Stan’s Donuts’ branding to the floor. RoughRap is a 2.1-mil gloss white high-performance vinyl designed for application on brick walls and other rough textured surfaces. When used in conjunction with PERMACOLOR RAYZor overlaminate, the life of the graphic can be protected inside for over eight years and helps to eliminate fading from UV rays. RoughRAP delivered the extreme conformability and toughness needed to bring life to Stan’s Donuts’ tiled walls.